Expect approximately 45 minute – 3 hour install time. Purpose: When the gas pedal is pressed that pulls the throttle cable. The throttle cable pulls on the cam that rotates the throttle body blade. The amount the blade opens is directional proportional to the amount of air that enters the intake manifold. You want the blade to open as close to 90° as possible. In most cases your throttle body blade stops way short of the 90° from the factory. You will need Auto Tap or equivalent scan tool (Tech II) to perform this installation CORRECTLY!! 1. You will need to hook up a scan tool (i.e. Auto Tap, Tech II) and note the TPS Voltage (found under the Fuel Systems menu). You want to just turn the key forward but do not start the car. In later versions of Auto Tap, it will show a number in degrees. Otherwise, you might end up a voltage as a number. Our version of Auto Tap showed the number in degrees. After hooking up Auto Tap we pressed the gas pedal to the floor board and noted the our throttle body blade was opening 78.8°. 2. 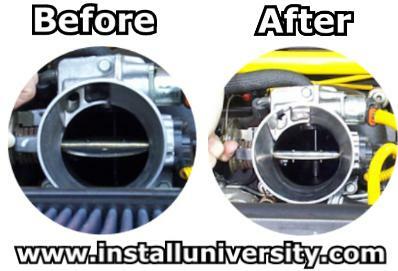 We removed the air filter, air box, mass-air-flow (MAF) housings, MAF sensor, and rubber tubing (see Figure 1). Undo the air box clamps (see red arrows in Figure 1), remove the IAT and MAF sensor harnesses (see blue arrows in Figure 1), and loosen the the metal band clamp using a flat-head screwdriver on the rubber bellow on the throttle body (see pink arrow in Figure 1). 3. Ideally, you would like the opening to be 90° but this is not practical. 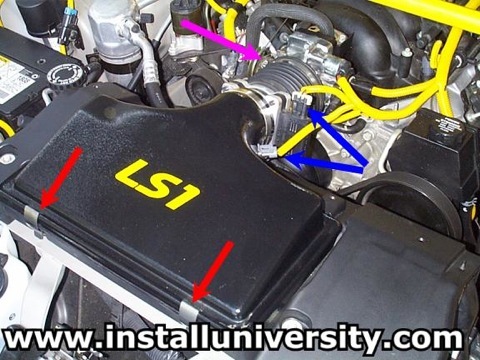 If the number of degrees exceeds 90°, then you will set a Service Engine Soon (SES) light. In order to let your throttle body blade open more you have to grind some metal off of the throttle body bump stop. 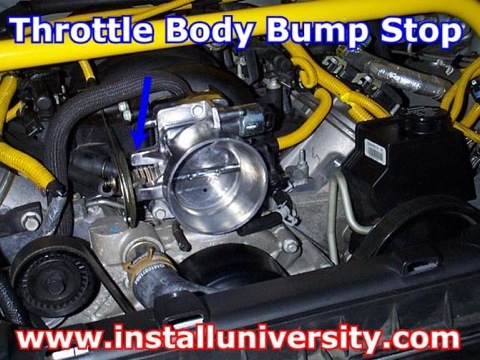 Locate the throttle body bump stop in Figure 2. 4. You will need to take your dremel tool and grind down the bump stop where the throttle cable cam touches. It is important that you constantly check the progress you make while you are grinding. Lift the cam and check the number of degrees the throttle body blade is opening. You don't want to go over 90° Just lift the cam up and note where it touches the bump stop (see Figure 3). Take a look at the bump stop mid way through the process (see Figure 3). Auto Tap reported that we were at 83.5°. It took us 45 minutes to reach this point. 5. You can see the finished product in Figure 4. You can clearly see the difference before and after. The final measurement taken from Auto Tap was 87.8° and that is a good conservative place to stop. The added 9° of opening has resulted in the throttle body blade opening more flat than before. Remember, if you open the throttle body more than 90° you will set the Service Engine Soon (SES) light. 6. Replace your air induction setup back on the car and you are ready to go. Comments: This is a good, free modification to perform on your car. You heard us say it before and we will say it again, "Every little bit helps".